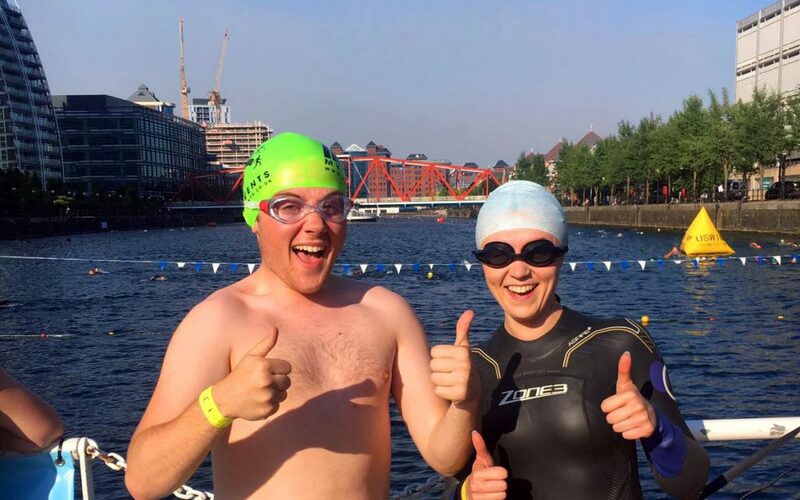 So apparently, outdoor swimming is the newest trend to take Salford by storm. Naturally I had to throw myself in the deep end (excuse the very-much intended pun) to see what the fuss is all about. During a welcome talk that I attended when I first started university, I was told by my course leader that outdoor swimming was a phenomenon that had exploded in Salford since the birth of MediaCityUK. During the redevelopment, a plan to clean up the surrounding areas led to the chemical treating of Salford Quays, making the water safe to swim in. As the aqua-extravaganza has become such a hit, it’s no surprise that one of my colleagues, Vicki, was quick to send an email around the office, asking if anyone would like to join her during her weekly outdoor swim. Urm hello? Blog post alert. ‘The Big Swim’ is how I like to refer to the day’s events, as I feel like I’m featuring in my own Sport Relief mega-challenge. On the day of ‘The Big Swim’, I must be totally honest, I was terrified. Out of impulse I was telling everyone I bumped into of the events I was about to embark on. Almost as self-gratification, perhaps? Knowing that if it went south for me, I’d always be remembered by those who knew of my challenge. Primarily the cleaner mopping the floors in my accommodation building, and the barista who served me my soya latte in Pret earlier that day. Seren and Rhys waiting to get into the water. In the days leading up to our challenge, Vicki assured us that there was no need for a wet suit, as she swims each week without one. 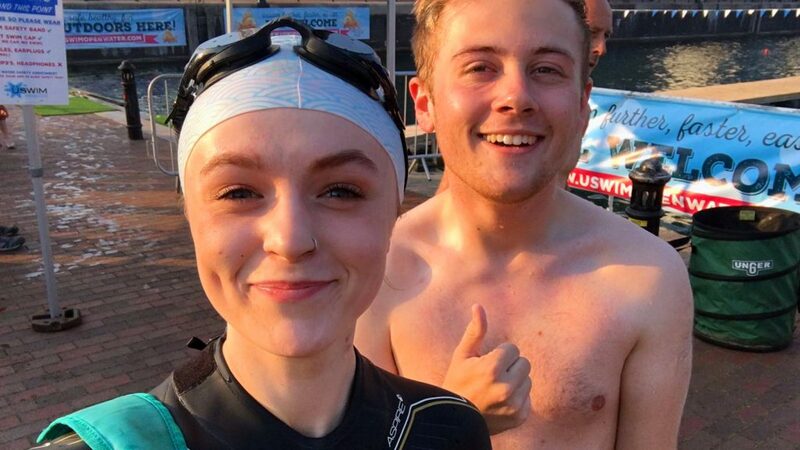 What Vicki had failed to mention, is that while she swims without a wetsuit now, it took her several weeks to become accustomed to the crippling temperatures of Salford Quays, and did in fact start in a wetsuit. Thanks Vicki. At risk of being melodramatic, I must add that this particular day was the hottest day since 1971, but I would argue that this simply creates more intensity to the temperature change and the shock that comes with it, as you submerge your body into open water. 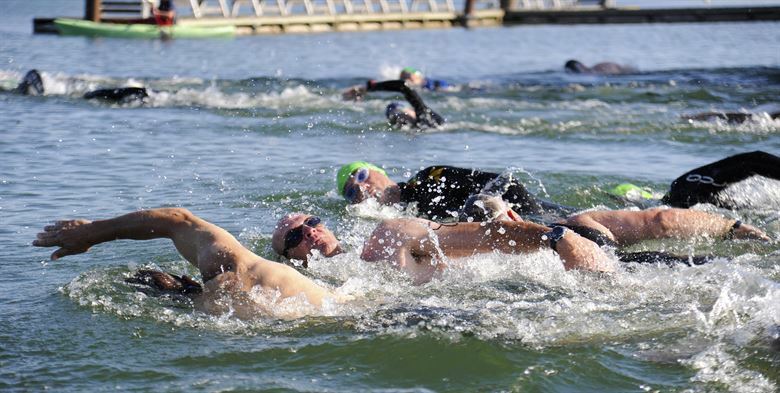 Once you’re in the water, you have as long as you need to make sure you’re comfortable with the temperature and your breathing, and then off you go! There are two circuits you can swim, depending on how confident you are. The first being a 500m circuit and the second being 750m. It’s worth mentioning, this isn’t something for you if you can’t swim 500m (20 lengths of a standard indoor pool) without putting your feet down. The reason being that, unless your legs are 6m long, you won’t be able to reach the bottom until you complete a circuit and reach the platform used to get in and out of the water. Rhys and Seren in their swimming caps, about to enter the water. For me, open water swimming was honestly one of the most liberating experiences I’ve had all year. The freedom that comes from the juxtaposition of being in the open, boundless mass of water, met with an intense city environment was truly satisfying. I felt like I was utilising the city on a totally new level, quite euphoric when combined with the buzz from the endorphins brought on by exercise – something I’m not a whole lot used to. It gets better. Outdoor swimming isn’t too heavy on the student purse either. If you give it a go as a one-off, you pay £8, or you can pay for seasonal membership which costs £10, and then £5 per session thereafter. You also pay an £8 fee to borrow a wetsuit for the session, which is also topped with a £12 refundable deposit. All I can say, is that it’s something I highly recommend you try during your time in Salford. For full details on pricing and rules, visit the USWIM website.